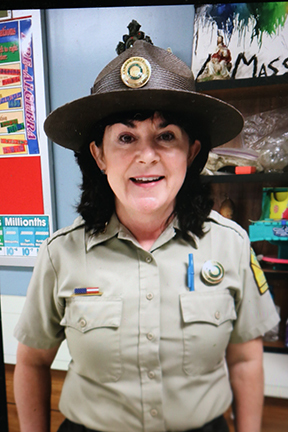 Park Ranger Margaret Ellis from Woolly Hollow State Park was another guest speaker at the Science Camp which wrapped up today. She talked about the many species of birds that either live in or pass through the park each year. There are at least 40 kinds of birds that live in the park such as cardinals, orioles, bald eagles, buntines, and red-shouldered hawks. Ms Ellis engaged the children in a kind of board game where each child was assigned a different species of bird and then had to pass through various obstacles that migratory birds encounter. These included watching out for power lines, avoiding pet cats or kids with bb guns, or eating on polluted marshes.